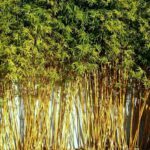 Bamboos are giant grasses, members of the Poaceae family. Their stems are distinctly divided into sections by joints. 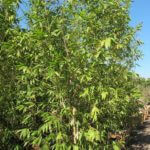 Bamboos can be spreading or clumping. The spreading varieties grow by underground rhizomes, which can spread large distances, but can be contained with barriers and a little work. Clumping varieties also spread by underground rhizomes, but only a short distance, and then grow around the edges. 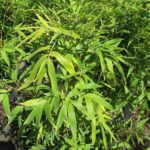 Smaller bamboos can be grown as groundcovers, while spreading or running bamboos form handsome hedges. Clump bamboos can be used like common shrubs and give a tropical feel to the landscape.